Metro High School students working "TIP" voter in the 2012 election. I learned that you can lie and people will believe you. -- Greg, an eleventh grade student. This statement would shock most people but his teachers were proud. Greg, a student at Metropolitan Arts and Technology High School in San Francisco (an Envision School), and his classmates had just finished presenting their California Proposition Campaign Ads. Greg’s reflection met one of many outcomes: that by producing media, students will become better consumers of media -- especially election campaign advertising. 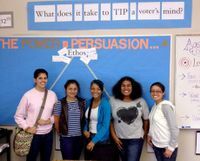 Suzie Boss highlighted this project and other election projects in this Edutopia blog. I’d like to offer below an explanation and tools if you would like to replicate this project at your school. Here is a video overview of the project produced by the Pearson Foundation. The Political Campaign Ad project was originally created by the Communications Academy at Sir Francis Drake High School in California’s San Anselmo. Here is an example from the 2010 election title, "No on Prop. 23." You have spent the past several months taking a hard look at how the media employs persuasive techniques in targeted ways to try and change the public’s mind about people and issues. At the same time, we have been reading about the critical factors that help to “tip” ideas, products, and movements from just a fad to a trend or an epidemic. You must now synthesize all of that learning into an argumentative essay that lays out your best analysis of the most powerful persuasive technique, and the effect it can have. You will incorporate evidence from multiple media advertisements, any of the articles we have read in class, as well as excerpts from Malcolm Gladwell’s The Tipping Point to support your claim. This argumentative essay will serve as your endorsement of the most powerful persuasive technique used in written or visual communication. It is not too late to make this project happen for your students! Below are resources so you can adapt and implement. A special thanks for Justin Wells (former Metro teachers) and Abby Benedetto (current Metro teacher) for sharing their materials for this project. Here’s the Campaign Ad Project Website, complete with exemplars. You can also download some of the most useful materials here. If you decide to implement this project, please post a link to your student work. I will post a link to the 2012 Metro Campaign Ads following the election.